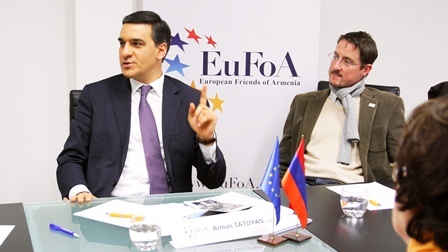 Today, in our Brussels office, Mr Arman Tatoyan, Human Rights Defender (Ombudsman) of the Republic of Armenia gave a briefing followed by a lively debate about the Human Rights situation in Armenia. He explained the new tools given to his institution, such as immunity for his members of staff, the Ombudsman’s permanent representative in the Armenian Parliament, and the new forms of NGO involvement in his work. “The institution of the Ombudsman in Armenia is now strong and legally protected like no other in Eastern Europe”, Mr Tatoyan said, adding that especially the enhanced cooperation with NGOs in Armenia helps the effectiveness of his work. Key fields of activities are torture prevention, fighting domestic violence, supporting freedom of speech and the legal framework surrounding the upcoming elections. “We are delighted that he gave us the opportunity to ask so many, at times tricky questions, and that our guests from the EU institutions and international NGOs were able to receive valuable first-hand information”, acting director Dr Michael Kambeck concluded.